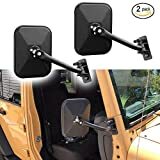 Jeep Mirror Laws - Don't get busted with your doors off! 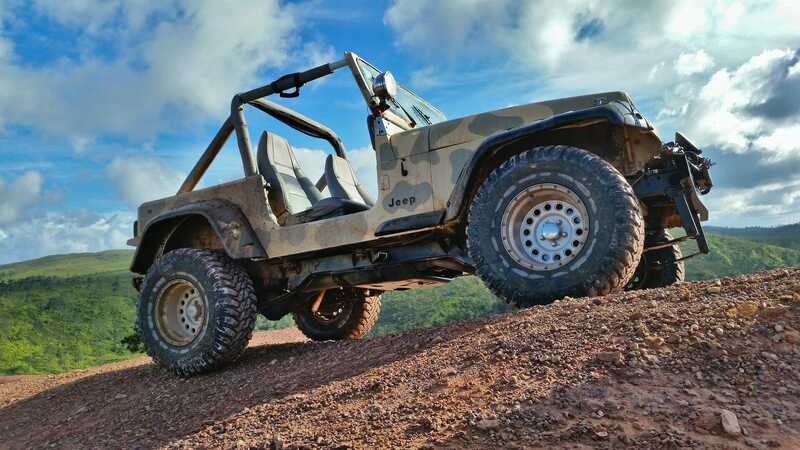 Home Gear & Tech Jeep Mirror Laws – Don’t get busted with your doors off! Sometimes you have to learn lessons the hard way – you go on a road trip across a few states and before you know it you’re being pulled over and ticketed for driving without mirrors. You think to yourself for a minute “but the doors come off as a feature from the factory” – But some states simply don’t care. The real question you may be asking yourself is “Is it legal to drive with the doors off?” – The answer is “Yes” but the law applies to MIRRORS not to DOORS. 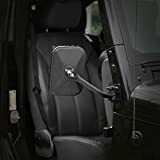 There are no state laws requiring doors, however, on most Jeeps, the mirrors are attached to the doors so that is where you may violate local laws. Here are the state laws for all 50 states regarding mirror requirements. We’ve tried to distill them down to “Required“, “unobstructed rearview mirror ok” (no trailer) or “Vague” if there is too much gray area. All states have links to the applicable code. Every motor vehicle, operated singly or when towing any other vehicle, shall be equipped with a mirror so located as to reflect the driver a view of the highway for a distance of at least 200 feet to the rear of such motor vehicle. The motor vehicle must be equipped with a mirror mounted on the left side of the vehicle AND the right if towing. A motor vehicle that is constructed or loaded in a manner that obstructs the driver’s view to the rear of the vehicle from the driver’s position shall be equipped with two mirrors located in a manner to reflect to the driver a view of the highway for a distance of at least two hundred feet to the rear of the vehicle. Every motor vehicle shall be equipped with a rearview mirror. If rearview mirror is obstructed then a mirror which provides a view of the highway for a distance of at least 200 feet to the rear of the vehicle is required. Out of state registration only requires unobstructed rear view mirror. In state registration requires at least two mirrors with one on the left. Vehicles that are towing require unobstructed mirrors. Whenever any motor vehicle is not equipped with a rear window and rear side windows or has a rear window and rear side windows composed of, covered by, or treated with any material or component that, when viewed from the position of the driver, obstructs the rear view of the driver or makes such window or windows nontransparent, or whenever any motor vehicle is towing another vehicle or trailer or carrying any load or cargo or object that obstructs the rear view of the driver, such vehicle shall be equipped with an exterior mirror on each side so located with respect to the position of the driver as to comply with the visual requirement of subsection (1) of this section. Commercial for-hire vehicle specific laws require rear and left side viewing. All motor vehicles and motorcycles shall be equipped with a mirror so placed that the driver thereof may readily ascertain the presence of any vehicle traveling in the same direction and overtaking the driver’s vehicle. Every vehicle, operated singly or when towing any other vehicle, shall be equipped with a mirror so located as to reflect to the driver a view of the highway for a distance of at least 200 feet to the rear of the motor vehicle. Every motor vehicle which is so constructed or loaded as to obstruct the driver’s view to the rear thereof from the driver’s position shall be equipped with a mirror so located as to reflect to the driver a view of the highway for a distance of at least 200 feet to the rear of such vehicle. Every motor vehicle shall be equipped with a mirror or mirrors so located as to reflect to the driver a view of the highway for a distance of at least 200 feet to the rear of such vehicle. Every motor vehicle shall be equipped with a mirror so located as to reflect to the operator a view of the highway for a distance of at least two hundred (200) feet to the rear of the vehicle. Every motor vehicle, operated singly or when towing another vehicle, shall be equipped with a mirror so located as to reflect to the driver a view of the highway for a distance of at least 200 feet to the rear of such motor vehicle. A motor vehicle that is constructed or loaded so as to obstruct the driver’s view to the rear from the driver’s position must be equipped with a mirror located so as to reflect to the driver a view of the highway for a distance of at least two hundred (200) feet to the rear of the vehicle. After January 1, 1975, every motor vehicle shall be equipped with a mirror mounted on the left side of the vehicle and so located as to reflect to the driver a view of the highway to the rear of the vehicle. Every motor vehicle, except a motorcycle, shall be equipped with an additional mirror mounted either inside the vehicle approximately in the center or outside the vehicle on the right side and so located as to reflect to the driver a view of the highway to the rear of the vehicle. After January 1, 1975, every motor vehicle manufactured or assembled after December 31, 1972, of a type subject to registration in this state shall be equipped with a mirror mounted on the left side of the vehicle and so located as to reflect to the driver a view of the highway for a distance of at least two hundred feet to the rear of the vehicle. A person may not operate on a public way a vehicle so constructed, equipped, loaded or used that the operator is prevented from having a constantly free and unobstructed view of the way immediately to the rear, unless there is attached a mirror or reflector placed and adjusted to afford the operator a clear, reflected view of the highway to the rear of the vehicle for a distance of at least 200 feet. Every motor vehicle shall be equipped with at least one mirror located to reflect to the driver a view of the highway for a distance of at least 200 feet to the rear of the vehicle. Every motor vehicle registered in this State shall be equipped with an outside mirror on the driver’s side located to reflect to the driver a view of the highway for a distance of at least 200 feet to the rear of the vehicle and along the driver’s side of the vehicle. This subsection does not apply to motorcycles, which are governed by subsection (c) of this section. Maryland Statue Transportation – §22–403. Vague – better safe than sorry to have mirror. A person shall not drive a motor vehicle if driver visibility through the rear window is obstructed, unless the vehicle is equipped with 2 rearview mirrors, 1 on each side, adjusted so that the operator has a clear view of the highway behind the vehicle. Every motor vehicle which is so constructed, loaded or connected with another vehicle as to obstruct the driver’s view to the rear thereof from the driver’s position shall be equipped with a mirror so located as to reflect to the driver a view of the highway for a distance of at least 200 feet to the rear of such vehicle. All motor vehicles which are so constructed or loaded that the operator cannot see the road behind such vehicle by looking back or around the side of such vehicle shall be equipped with a mirror so adjusted as to reveal the road behind and be visible from the operator’s seat. No person shall drive a motor vehicle, other than a motorcycle, on a highway when the motor vehicle is so constructed or loaded as to prevent the driver from obtaining a view of the highway to the rear by looking backward from the driver’s position unless such vehicle is equipped with a right-side and a left-side outside mirror so located as to reflect to the driver a view of the highway for a distance of at least two hundred feet to the rear of such vehicle. On and after January 1, 1970, every motor vehicle, operated singly or when towing any other vehicle, shall be equipped with a mirror so located as to reflect to the driver a view of the highway for a distance of at least 200 feet to the rear of such motor vehicle. No person shall drive upon any way any closed motor vehicle, or motor vehicle so constructed, equipped, or loaded that the driver is prevented from having a constantly free and unobstructed view of the way immediately in the rear, unless there is attached to the vehicle a mirror or reflector so placed and adjusted as to afford the driver a clear, reflected view of the way in the rear of the vehicle. Every motor vehicle shall have rear view mirrors so located and angled as to give the driver adequate rear view vision. Every passenger automobile manufactured after January 1, 1965 and registered in this State, shall be equipped with an interior mirror and an exterior mirror on the driver’s side. It shall be unlawful for any person to operate upon the highways of this State any vehicle manufactured, assembled or first sold on or after January 1, 1966 and registered in this State unless such vehicle is equipped with at least one outside mirror mounted on the driver’s side of the vehicle. On and after January 1, 1964, every motor vehicle, operated singly or when towing any other vehicle, must be equipped with a mirror so located as to reflect to the driver a view of the highway for a distance of at least two hundred feet [60.96 meters] to the rear of such motor vehicle. Every motor vehicle, motorcycle, and trackless trolley shall be equipped with a mirror so located as to reflect to the operator a view of the highway to the rear of such vehicle, motorcycle, or trackless trolley. Operators of vehicles, motorcycles, streetcars, and trackless trolleys shall have a clear and unobstructed view to the front and to both sides of their vehicles, motorcycles, streetcars, or trackless trolleys and shall have a clear view to the rear of their vehicles, motorcycles, streetcars, or trackless trolleys by mirror. Every motor vehicle shall be equipped with a mirror mounted on the left side of the vehicle and so positioned and located as to reflect to the driver a view of the highway to the rear of the motor vehicle. Every motor vehicle shall be equipped with an additional mirror mounted either inside the vehicle approximately in the center or outside the vehicle on the right side and so positioned and located as to reflect to the driver a view of the highway to the rear of the vehicle. A rearview mirror or device only meets the requirements of this section if it enables the driver of the vehicle to have such a clear and unobstructed view of the rear at all times and under all conditions of load as will enable the driver to see any other vehicle approaching from not less than 200 feet in the rear on an unobstructed road. No person shall operate a motor vehicle or combination on a highway unless the vehicle or combination is equipped with at least one mirror, or similar device, which provides the driver an unobstructed view of the highway to the rear of the vehicle or combination. Every motor vehicle which is so constructed or loaded as to obstruct the driver’s view to the rear of it from the driver’s position shall be equipped with a mirror so located as to reflect to the driver a view of the highway for a distance of at least two hundred feet (200′) to the rear of the vehicle. Caution: Second part could cover Jeep as “Passenger vehicle” – not sure if commercial or for hire. Every motor vehicle, the primary function of which is the carrying of passengers, shall be equipped with a rear-view mirror on the left front door or fender, so located as to reflect a view of the highway for at least two hundred feet (200′) to the rear of the vehicle. Rear-vision mirrors required–Visibility distance–Violation as petty offense. Every motor vehicle entitled to be licensed in South Dakota shall be equipped with a mirror so located as to reflect to the driver a view of the highway for a distance of at least two hundred feet to the rear of such vehicle, whether operated singly or towing another vehicle. A violation of this section is a petty offense. 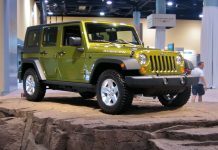 ** Unknown – Does the state license Jeep as “truck” or does the state assume “truck” as commercial vehicle? Unobstructed Rear View Mirror OK – Required while towing. Requires a mirror of at least 5 inches in diameter to reflect the view of other vehicles approaching from the rear while towing. Every vehicle manufactured since 1968 needs at least one outside and one inside mirror. Every vehicle shall be equipped with a mirror mounted on the left side of the vehicle and either a center mirror or right mirror. Each motor vehicle shall be equipped with a mirror or mirrors so located as to reflect to the driver, under all conditions of loading, a view of the highway for a distance of at least two hundred feet (200 ft.) to the rear of the vehicle; Provided, that all vehicles licensed under the provisions of paragraph 31(b) and (c) of the Act of July 1, 1932, shall be equipped with two (2) adjustable rear-view mirrors installed to enable the driver to obtain a reasonably clear view toward the rear. No person shall operate a vehicle upon a highway unless the vehicle is equipped with a mirror to reflect the roadway for a distance of 200 feet to rear of the vehicle. Could be a center mirror but you may need an external mirror if your center mirror is obstructed. Every vehicle manufactured since 1/1/1986 is required to have a mirror on the left side of the vehicle. Most states just require you to have a clear view and as long as you still have a rear view mirror you’re legal. Make sure you plan ahead on your trips and know when driving across states that you follow all local laws. 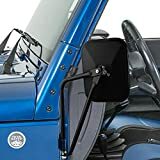 I find it’s better to be safe than sorry so if you do a lot of door off driving, I’d recommend some side mount mirrors that can attach to your windshield frame or door mount brackets. If you need a mirror that you can use without doors installed, these simple devices work well enough to make sure you’re adhering to all applicable laws. Don’t forget – Many states have laws on light bars, headlamp colors, turn signals/wheel flare reflectors and other “gotchas” you should be aware of. Drop a comment below and let us know what odd state laws you have to abide by and we’ll keep this post updated! 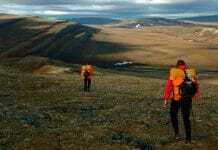 Previous articleJeep Roof Tent Deep Dive – Expedition RTT Camping in Style!